Fig A: An Orange-breasted Sunbird feeding on Agapanthus. Photograph © Debra Green. by Keith Green (photographs also by the author unless otherwise stated). 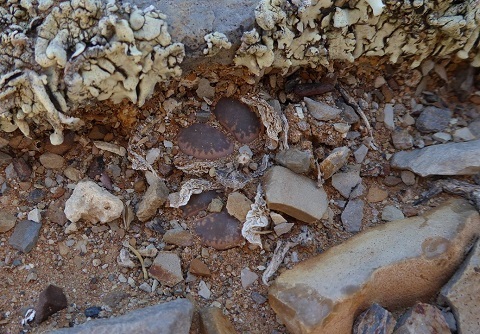 In February 2018, as part of a two week trip centred in Cape Town, South Africa, I spent three days searching out two species of Lithops at the southern end of their distribution range. During our stay, Cape Town was gripped by severe drought and every effort was being made to avoid “day zero”, the day the taps would have to be turned off. Also at this time Mr. Zuma resigned as president, so there was much going on around us. 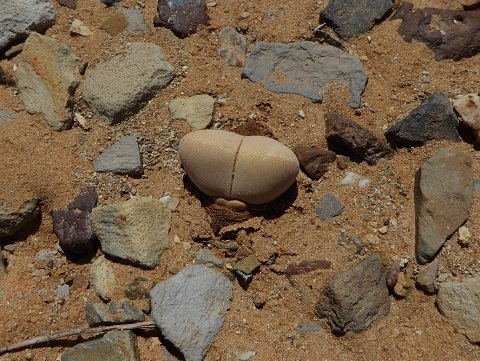 For the most part though, this was a holiday with my wife Debbie and my eldest son Christopher, although I could not visit Southern Africa without at least trying to photograph some habitat Lithops. We were therefore joined mid-trip by local resident Dr. Ronnie Ujis for a short jaunt into the veld. 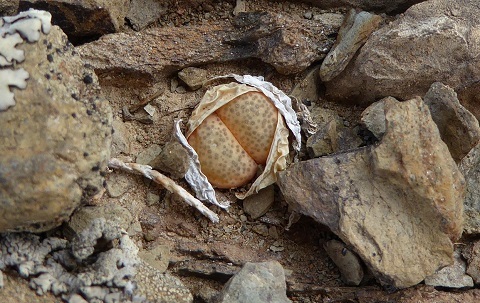 Although Lithops do not grow naturally in Cape Town, the diverse, coastal, fire-reliant scrub known as fynbos does, with many of the constituent species endemic to the tiny Cape Floral Kingdom. 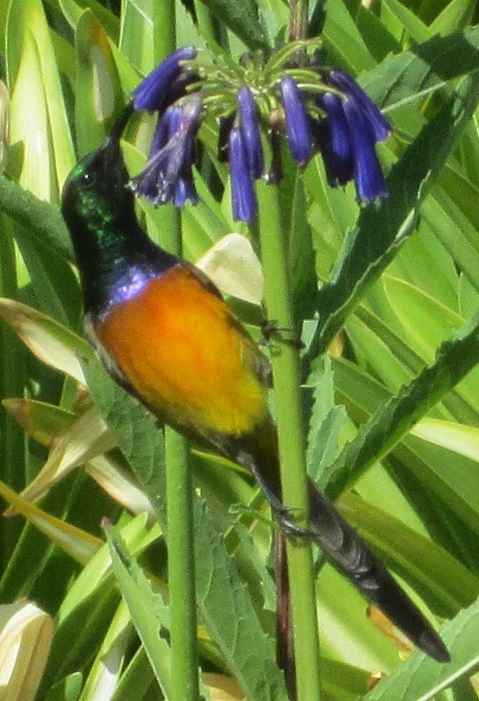 I made a point of exploring the fynbos, and in Kirstenbosch Garden was dazzled by the also endemic Orange-breasted Sunbird (Anthobaphes violacea) feeding on some Agapanthus inapertus subsp. pendulus (Fig A). 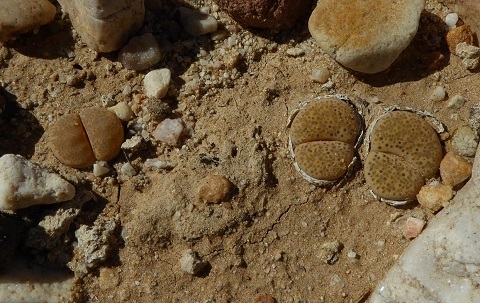 The closest habitat Lithops however lay the best part of two hundred kilometres inland, in totally different terrain. North-east of Ceres, on the western fringe of the vast semi-desert Karoo can be found L. comptonii var. comptonii, but only if you know where to look. It was this little gem we first encountered on our mini field trip, but the looking had to be intense and I would never have found it without Debbie and Ronnie. We first searched at what most likely was the C125 locality. 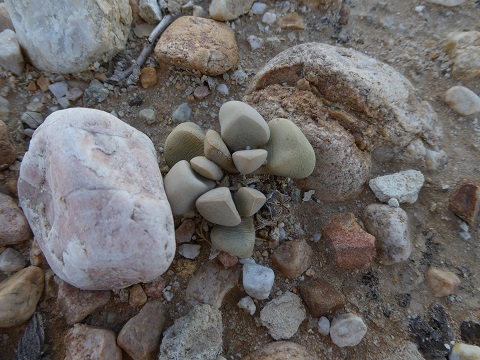 Clearly there had been recent rain, but although we found many Anacampserous so often associated with Lithops localities, we failed to spot any of our target plants. Given the nearby puddles it seemed unlikely the Lithops were too well hidden, so unfortunately habitat poaching may be to blame. At first we also drew a blank at our next rock strewn search site, which most likely was the C377 locality, but perserverance is key. 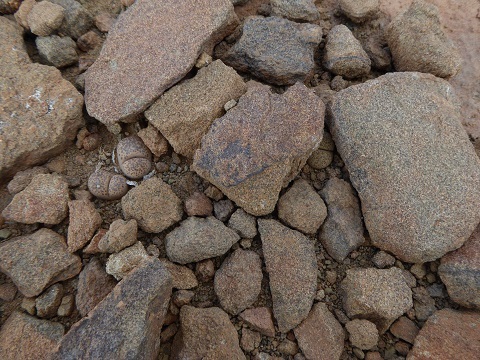 It is not until you get down to ground level and really look among the rocks and stones that an amazing amount of plant (and animal) life comes into focus. Didymaotus lapidiformis (Fig B) and unexpectedly heavy lichen encrustations were relatively easy to find, but not so L. comptonii var. comptonii. Eventually however Debbie spotted a plant (Fig C), and then another (Fig D). 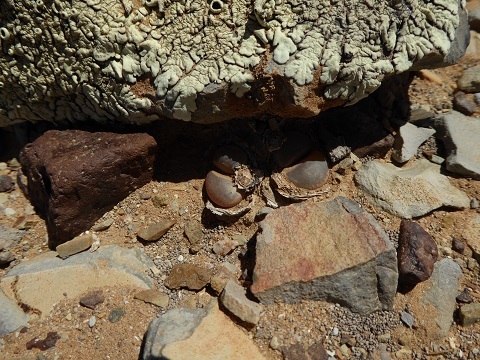 The bright sunshine and the way the Lithops grew beside and almost under some rocks made them extremely difficult to see clearly or photograph, but we did our best. 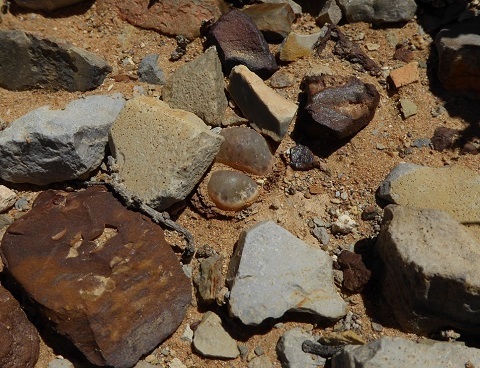 Many of the rocks were of a dark colour so absorbed rather than reflected the sun, which perhaps explains why the plants seemed to crave some shade (Fig E). Disturbing the surrounding cover could have damaged the plants, so we left well alone and examined our quarry through squinting eyes and improvised shade. It was not until I studied my photographs that I could truly appreciate the purple rock mimicking undertones, the open windows and the delicate var. comptonii margins. It is rare to find such deeply coloured specimens in Northern European cultivation, but then again so is such intense and sustained sunshine. Some consider L. comptonii var. comptonii a “plain–Jane” among Lithops, but my pictures bear testament to true functional beauty. One specimen (Fig F) had a hint of var. 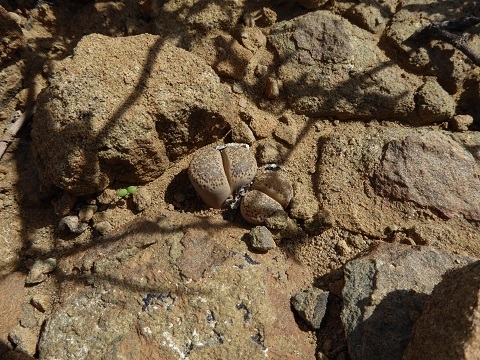 weberi about the margins, but not so the immediate neighbour we saw sheltering under lichen (Fig G). Nature seemed to be left alone at this locality which was hot, silent and starkly beautiful. Fig C: L. comptonii var. comptonii, our first specimen. Fig D: A two headed L. comptonii var. comptonii photographed in improvised shade. Fig E: L. comptonii var. comptonii as it is; living on the edge of sunshine and shade. Fig F: A hint of var. weberi on var. comptonii. Fig G: L. comptonii var. comptonii sheltering under a lichen roof. Skirting the western fringe of the Karoo, we continued toward the Swartberg Mountains. Around the Laingsburg area we searched unsuccessfully at two localities for L. terricolor (known by some as L. localis), where previously they had been seen in abundance. 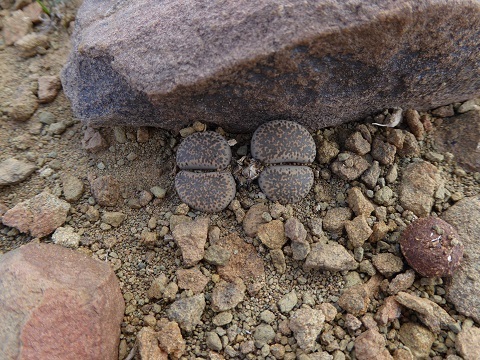 Although we discovered many of the usual Lithops bed-fellows, the Lithops themselves were absent, or at least appeared to be absent. 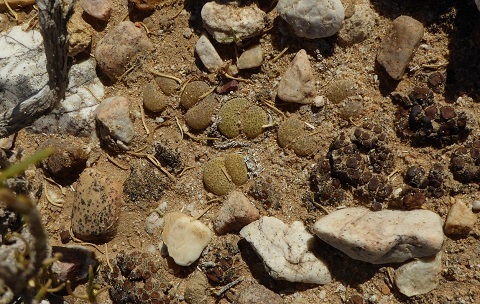 The visible number of Lithops at any given locality naturally wax and wane in reaction to many factors, and I sincerely hope our failure was due to entirely natural causes and regeneration will occur in due course. The following day we headed east toward Prince Albert via a farm just north of the N1 road. 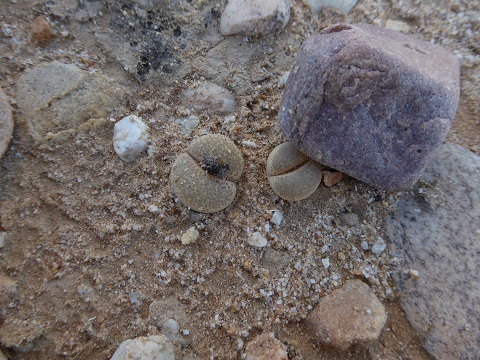 The farmer was expecting us, and we followed him across his land in our 4X4 to a remarkable area where L. terricolor lives among both pebbles and in the fissures of some flat rock formations (Fig H). Although I found the plants extremely difficult to spot, the farmer had no such issues and strolled around pointing out specimens with ease (Figs I, J). All the plants were fully turgid, heavily speckled and of varing size. The colours were strikingly variable, but somehow directly reflected the particular shade of rock or general terrain housing them (Figs K, L). My guess is the best camouflaged survive to pass on the same trait to their children, a kind of natural selection akin to the theories of the great Charles Darwin. It is little wonder there are so many L. terricolor cultivars. 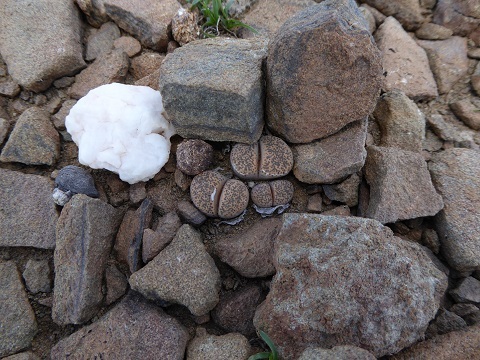 Apparently Lithops grow at several places on this relatively small farm, which is at a latitude slightly further north than the L. comptonii locality we visited the previous day. 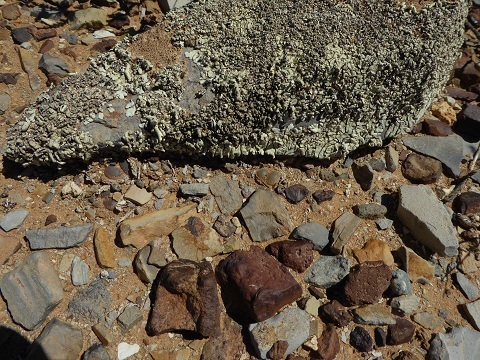 A light lichen encrustation was evident on some of the surrounding rocks, but there seemed to be a general absence of any other succulent plants in the immediate area of the Lithops. We were treated to typical Afrikaans hospitality in the farmhouse before continuing our drive to Prince Albert. 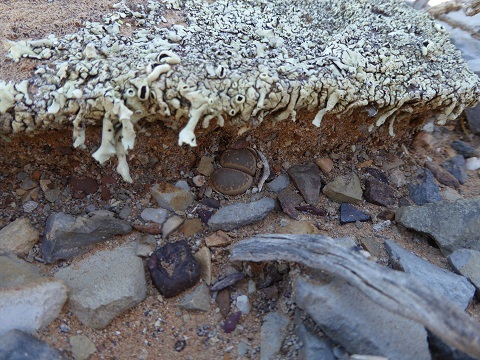 Fig H: L. terricolor happily growing in a rock fissure. Fig I: A clump of habitat L. terricolor with a touch of scorch. 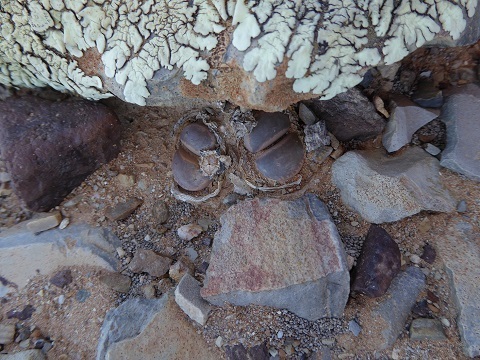 Fig J: L. terricolor pristine in habitat. Fig K: Remarkable colour mimicry on these 3 L. terricolor heads. Fig L: Different colours, same remarkable camouflage. That afternoon, just north of Prince Albert but at a latitude slightly further south than our L. comptonii encounter, I was led to a conservation site part funded by the British Cactus and Succulent Society. The area had been cordoned off by a wire fence, and a notice erected telling visitors to telephone one of two numbers to obtain access. Unfortunately calls to both numbers were unsuccessful, and although it would have been very easy to slip between the flimsey wires, tresspass is not in my nature. Fortunately many ground hugging succulent plants, including L. terricolor (Fig M) and Bijlia dilatata (Fig N), were readily visible on both sides of the fence, and for once I could spot them with relative ease. Possibly this was the C134 locality, and as stated by Ronnie it was “loaded” with plants. Most specimens were small with conspicuous speckles, but on a few examples these features merged into almost open windows (Fig O). Colours were variable, ranging from a grey-yellow-green (almost a ‘Speckled Gold’) through shades of brown to almost black, most plants being covered in blown dust (Fig P). 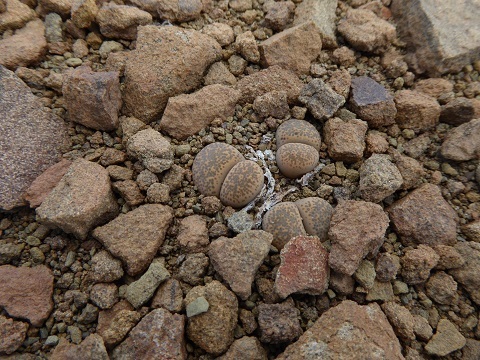 Here the Lithops were distributed in a similar fashion to the pebbles and rocks, and the variability of their colours made the colony as a whole invisible to any casual observer. I did not observe any lichen encrustations at this locality. Fig M: Four “earthy” L. terricolor heads. Fig O: L. terricolor; speckles and an almost open window side by side. Fig P: Six L. terricolor heads, two of which are almost ‘Speckled Gold’. We spent the night in Prince Albert and after pumping air into a slow puncture, headed off across the spectacular, if somewhat perilous “Swartberg Pass”. 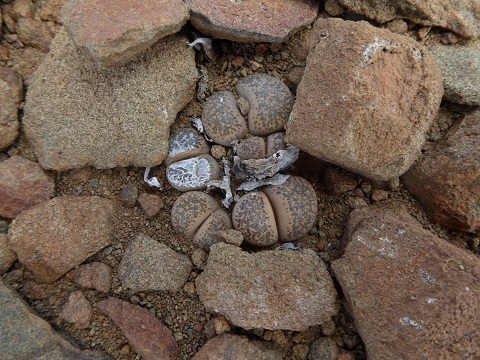 This road traverses the Swartberg Mountains which form part of an inland chain of Cape Folded Mountains that divide the Great (or Groot) Karoo to the north from the much smaller Little (or Klein) Karoo to the south, and shepherd L. terricolor at the very southern limit of Lithops distribution. The gravel road is in part a single track, and although it affords wondrous views across the Little Karoo, the sheer drops do somewhat temper the experience! After traversing the pass we turned west, and after eventually crossing back to the north side of the Swartberg through a lower pass, explored a most unlikely looking locality at the southernmost latitude of all our searches. 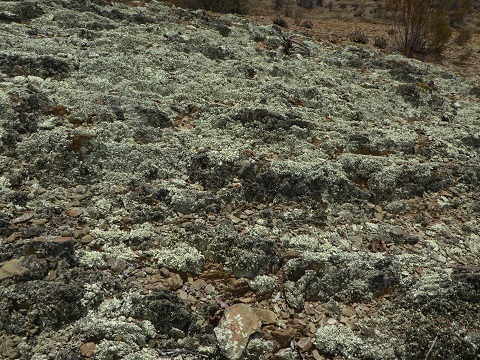 The tops of the koppies before us were heavily laden with light green lichen, giving the impression of dampness and of a Lithops hostile environment (Fig Q). 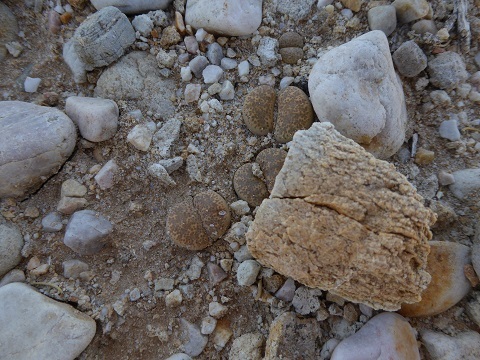 Had I not been told Lithops lived here I would never have looked, but on closer inspection it quickly became apparent the whole area was bone dry. It was not easy, but after an intense search Ronnie discovered a tiny two headed specimen embedded in the lichen (Fig R), and a short time later Debbie found another single head (Fig S). So small were these heads that I initially thought they were seedlings, a notion dispelled when the seed pods and wads of old leaves came into focus. The dots on Ronnie’s two headed plant were densely crowded together almost to the point of making open windows, whereas Debbie’s single head sported a more spotty look. 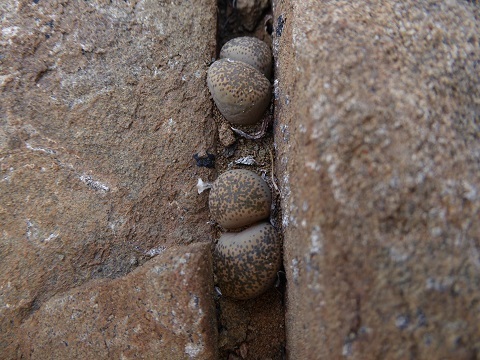 Somehow these tiny gems eke out a living, presumably from the moisture (possibly dew) that also sustains the lichen, and surely live on the very edge of where Lithops can survive. Most surely this is one of the most southern localities of the entire genus, which could go some way to explaining the tiny size of the plants. At this place human activity was not very far away, so we kept our stay short so as not to arouse suspicion. In their efforts to emerge from poverty, it is a sad fact some local people would strip the area of plants should they feel there were any financial benefit to be had, however small. Time now dictated a return to Cape Town, so we embarked on the long drive west from here. Fig Q: A most unlikely looking, lichen encrusted L. terricolor locality. 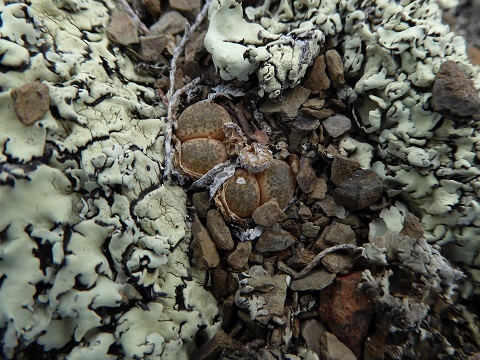 Fig R: L. terricolor among the lichen; two tiny heads and two seed capsules. Fig S: L. terricolor; tiny and spotty. On this short southern field trip I was most struck by the heavy lichen encrustations at two localities in particular. I recall seeing some mild lichen association back in 2008 when I visited the more northern L. viridis locality, but that was nothing like the heavy growth apparent at these most southern latitudes. Lichen is of course a symbiosis of a fungus and an alga, and the notion of fungus growing around Lithops is abhorrent in UK cultivation. Nothing can be asserted from such brief observations, but the correlation between Lithops, latitude and lichen is worthy of note. This was the first time I had travelled with Ronnie since the passing of our mutual friend Tok Schoeman of Windhoek. 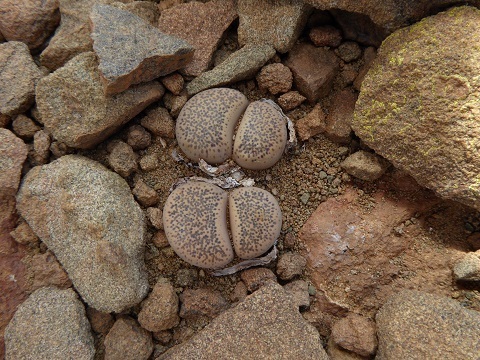 Although Tok and I lived thousands of miles apart, our interest in the natural world and especially Lithops brought us together on many occasions. Tok was gifted with an ability to instantly engage with people from all walks of life, was humble in manner, vastly knowledgeable and happy to share his wisdom. I am privileged to have known him as a close and trusted friend, and I shall forever cherish his memory. I give thanks to my travelling companions for their help and support during this trip, but especially to Ronnie for his wealth of local knowledge, patience and guidance. Without the help of the local people who know the land and each other, foreign visitors such as I would never get to see our treasured plants in habitat. It is therefore most important we never abuse the hospitality of our hosts and leave everything as we find it. As the old saying goes, “take only photographs and leave only footprints”. The following habitat photographs were taken during this trip but not submitted for publication elsewhere. L. comptonii var. comptonii (above) & L. terricolor (below). L. terricolor (above & below). 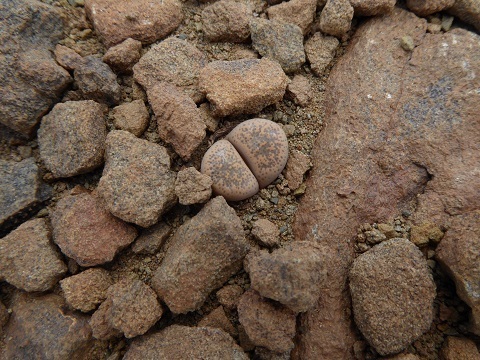 THE INTERNATIONAL CULTIVAR REGISTER AND CHECKLIST FOR THE GENUS LITHOPS N.E.BR. Using the Cole research as a base, this website will be updated as necessary. Copyright © 2013 Keith Green. All Rights Reserved. Unauthorised duplication or distribution prohibited.